I have a professional photographer friend. He works for news agencies. He covers up the brand name on his cameras. This was the only photo I could find from him with his camera but it shows the coverings. For media in particular, this prevents a logo from appearing in media. Events are often covered by multiple photographers and filmed which means that some people working may end up in the media too. Think of a making of video for example. Logos and brands are usually avoided because they may be misinterpreted as en endorsement or be seen as unpaid advertisement. Ming Thein once said he tapes the brands to "avoid reflections in reflective objects I photograph such as watches." Makes sense if you are into that sort of photography. Because he doesn't want to advertise for the camera brand. Yesterday I was taking photos at our son's graduation event. At middle of the event, another photographer on the other side of the large room took a direct look at me with his camera (Canon with a long lens) and then turned back to continue his job. That may have been a "gear-check" done on me and it immediately reminded me of this question here. to possibly prevent robbery of known and wanted brand in places where networked criminals show up after being informed by the little ones about your gear. in situations when you are already marketing or otherwise tied to another brand (toothpaste or car-maker etc.) which happens not to be the brand of your camera. Why the large majority of people who use cameras never cover their camera in tape? Because they don't get into situations like the above, or they just don't care, or it simply never crossed their mind to cover anything. Some even want to show brand names and markings. After spending a lot of money on their kit, why not let others take notice of it? Some pros might also cover up the branding to avoid the public approaching them all the time to ask about the gear. Not sure about your friend, but wedding photographers get interrupted all the time with questions, and I'd imagine if they'd get more questions if poeple recognised the brand and shot with similar gear. It's also common to cover them up to help reduce theft, as thieves will target certain brands. Pro cameras can get pretty beat up -without the brand, thieves might not give their gear a second look! The all powerful corporate promotional consideration. The same reason that product logos are frequently blurred out on video clips shown by news agencies and shows that use video clips from the public. You even see it in TV shows sometimes where they'll be using a product and will specifically remove branding. Typically when you do see branding, you'll see a blurb in the credits about promotional considerations being provided by such and such company and the product will be featured more prominently. I'd take a photo of my kit but i just sent it in for servicing this morning. 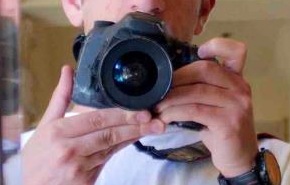 I personally cover EVERYTHING on my camera body AND lens that's not black with cut-to-size duct tape. I spend a lot of time shooting in less that ideal conditions and in places where i shoudln't be and don't want to be seen. Changing my 70-200mm IS II from white to black took some time, but it certainly hides it much better from casual observers. 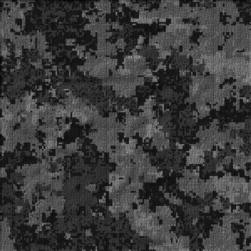 Essentially its 'urban camouflage' (i've been attempting to get a tape in a pattern like this however its been hard to find). The bright white word 'Canon' above the lens, the shiny '5DMKIII' stamp, the red-rings on the l-series lenses and even the flash hotshoe are all covered on my kit. The other reason I'll cover up everything on my kit is when I go out photographing wildlife with my girlfriend. Birds especially are quite 'touchy' about anything out of place (like a big white lens), so using things like lensCoats actually help from time to time. Main reason is that he wants to protect his camera from robbery when traveling in poor countries or dangerous zones. Many photographers use gaffer tapes for this kind of use because they are less sticky than ordinary duct tapes. I was asked a few times about how much my camera costs. Of course I lied because I think that it cost too much, more than a year's salary for some people, and they can easily grab it and run or threaten you. 99% of all that choose to do so. A lot of people do it when they travel so they're not advertising what camera they have.. same goes for the camera strap! Especially for the News Industries and other similar industries, assets (including gears such as camera, lens, even accessories) are considered CONFIDENTIAL. Though Competitions - Rival networks and companies, once they get to know the exact Make and Models of a Leading Company for example, then the tendency is that they are going to use the same equipments. This is critically important since TV networks competes for First Air News Break, they need an equipment that can deliver news materials as fast as possible - which today is already possible through Wifi-enabled DSLRs. Unpaid Endorsements - TV Networks generates their profit from advertising may only advertise a particular product only if that product has paid for it. They may be charge of unfair endorsement if they will not keep it confidential. Doing for copyright reasons is one thing, but IMO it serves a negative purpose when done to avoid theft. Taping is obvious and is a form of false modesty amongst some circles. • “Oooh, you have taped the brand name, your camera must cost a fortune”! • "Oooh, that camera must be so much more expensive than it looks, else why would he make such an obvious attempt at hiding the brand?" When traveling, even if your camera is worth his house, most locals know roughly what a good camera costs, so lying to them is a bad idea. Not the answer you're looking for? Browse other questions tagged professional or ask your own question.